Pune is a city that I consider my second home. Post independence, when my paternal grandparents moved from Ferozepur in Punjab, they set up camp in Pune. My grandfather set up a book and toy store called Ratanjee on MG Road, or Main Street as it is called. My father was raised in that city, only to leave while he was in college. My uncle, cousins and many friends live there and until the time that I was in college, a part of almost every summer vacation was spent in Pune. Today, Ratanjee has been converted into an Archies Gallery. The items in the shop may have changed but the experience is still the same. My uncle personally attends to all customers, all my cousins were compulsorily drafted into the shop in all their free time from school and college and even after their regular day jobs. In fact, most of my memories of Pune are of loafing on Main Street every day until the shop closed, after which the whole family sat together over dinner, chai and chit chat until the wee hours of the morning. I had secrets and gossip to whisper about with each of my cousins and vice versa. All this would take place hiding out in the balcony or whispering in the dark on mattresses laid out in the living room. The other main highlight of Pune was always the food. Since we spent most of our days on Main Street, most of my food memories are from around there. Even though work and life have taken over and the visits to Pune have become increasingly infrequent, each visit sees a mad rush to cram in all the food that I possibly can in as little time. There are always freshly fried potato chips from Buddhani Waferwala. Garden walla Vada Pav. Steak at The Place and at Zamus. Lunch at Chinese Room or Prem’s. A meal at the Pune Club. Sandwiches and cold coffee from Marz-o-Rin or Chicken Puff from Pasteur Bakery next door. Bhel from the thela guy outside the shop. Pav Bhaaji from Juice World. Dabeli from the thela at the corner of Centre Street. Idli & dosa at Coffee House. Biryani and Khichda ordered-in in huge handis from Fakruddin Jalal’s or Supreme. Breakfast at German Bakery. And, of course, the numerous coffee-shops and nightclubs that came and went over the years. Gifts brought back to Delhi would always involve more packets of Buddhani Chips, Shrewsbury biscuits from Kayani Bakery, LaxmiNarayan Chewda, and multiple packets of Goda Masala and this Shengdana Chutney. These items are permanently on my list and anyone traveling to Delhi from Pune is expected to carry them for me. I recently ran out of my perennial stash of the shengdana chutney and just had to try and replicate it. I’m proud to say it has pretty much hit the spot! It instantly elevates a simple dal-chawal or any other mild curry. Sprinkle it over buttered toast or roll it up inside a parantha with a dab of ghee. Spice up a boring cucumber-onion-tomato salad with the dry chutney and a squeeze of lemon for variety. For a more wet, dip-able chutney, mix it with a little ghee, oil or curd. This is how AK insists he wants to eat it, because it reminds him of Podi (dry chutney powder had with dosa or idli). Use it as raita masala instead of the usual salt, mirchi and jeera combination. On occasion, I have also tossed it with boiled and cooled noodles+steamed veggies for a desi version of peanut noodles! 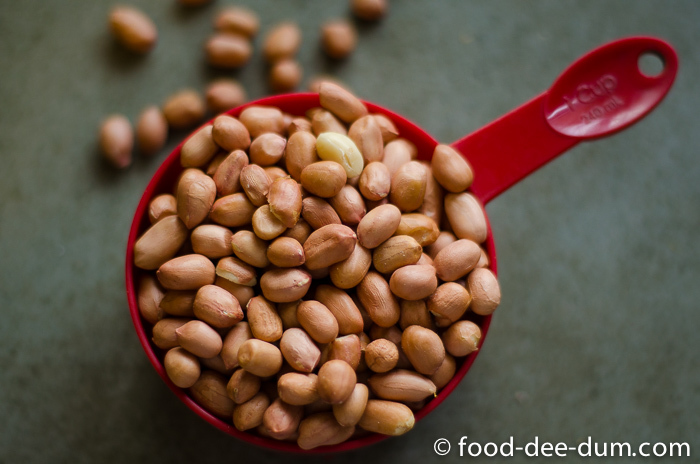 The usage and variation is endless and the minimal ingredients allow the peanuts to really shine through. Measured out the peanuts and set them on a tawa (griddle) to dry roast. On medium heat, with frequent stirring, it took about 7-8 minutes for the peanuts to brown and some of the thin papery outer skin to break and fall off. Taking the peanuts off the heat, I spread them out on a plate to cool completely. Once they had cooled, I rubbed them between my fingers until most of the papery skin fell off. Blowing on the plate gently caused all the loose skin to fly off leaving behind peeled peanuts — make sure you do this step over the sink or a layer of newspaper so that the clean-up becomes easier. From experience, I can assure you that it’s very painful and messy to clean up the skin if it flies all over the kitchen. 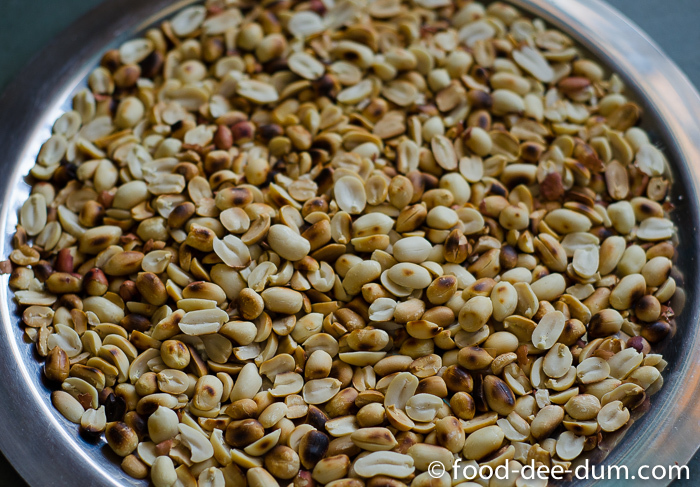 Placing these in the grinder jar of the mixie, I added the whole red chillies, the garlic pods and the toasted jeera seeds. I gave the mix a few pulses before adding the salt, deggi mirch and haldi. The mirchi and haldi are not for flavour, but more for the colour — the packaged chutney is orange-ish in colour and without the mirchi and haldi powders, mine looked more brown and I was compelled to do something about it. You can omit them if you don’t much care about the colour. I whizzed the chutney in short bursts until it became a coarse powder and parts of it started clumping up. I used a spatula frequently to stir and loosen up the mixture between each whiz else it would grind unevenly – some parts still too big while other parts would have become too fine and clumpy. We don’t want a smooth peanut-butter consistency, just a coarse powder. And we are done. And done. This quick and easy chutney is one of my favourites – spicy and slightly crunchy. Go try it today and I’m sure it will become one of yours too! 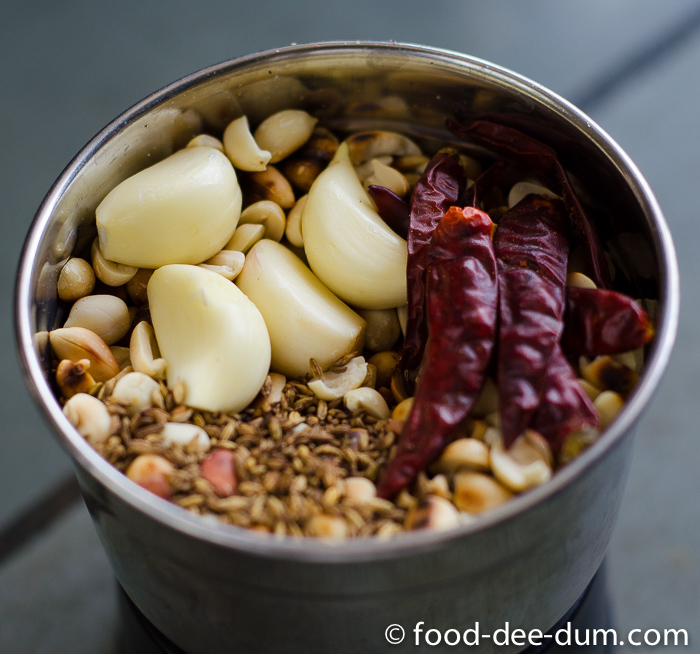 The garlic and red chillies can be dry roasted or heated with a little oil for a deeper flavour. Other variations include one or more of the following ingredients in addition to the basic recipe — dry roasted coconut, curry leaves, sesame seeds, coriander seeds, mustard seeds. My personal preference lies with the basic recipe because it is a little more versatile and easier to combine with many different dishes. Kharda (Maharashtrian Chilly Garlic Chutney): adds a pungent, spicy kick to paranthas, dal chawal or, if you’re as daring as I was, as a sandwich spread! Imli Sonth Chutney (Tamarind, Ginger & Jaggery Chutney): THE samosa and chaat chutney. 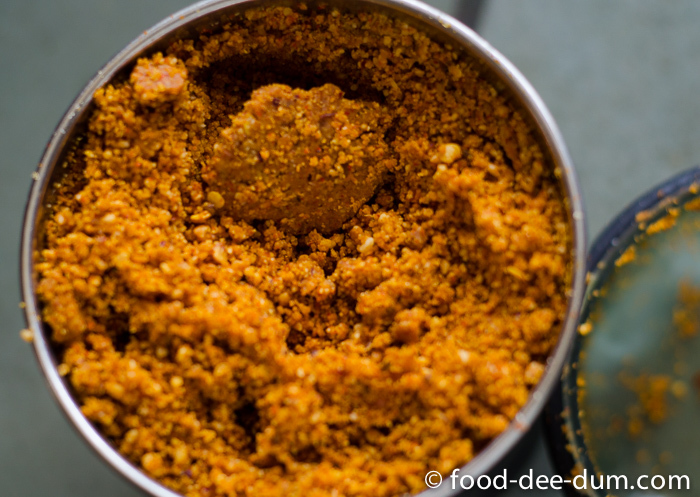 A simple, flavourful dry chutney powder which can be used dry or wet to add a little extra crunch and spice to your meal. Take these off the heat and allow them to cool on a tray. You can even speed up the process by putting these under a running fan. 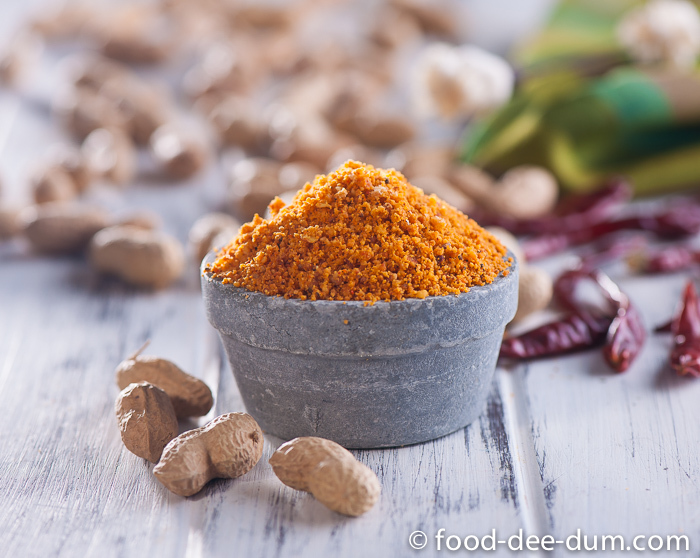 Place the peanuts in the medium jar of a grinder, along with the garlic pods, jeera and red chillies, and pulse a few times until they are rough chunks. Add the salt, deggi mirch and haldi and grind further until it forms a grainy powder and everything is combined. Make sure you stop short of it becoming clumpy and releasing all it's oils. Store in a clean jar in the fridge. Will last 3-4 weeks.